A comprehensive evaluation of BM involves examination of both marrow smears and tissue sections; each is complementary to the other. 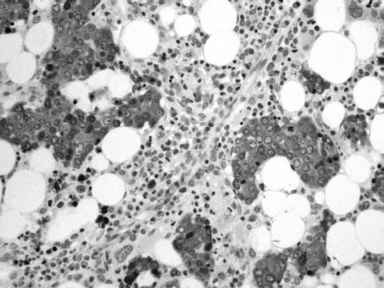 With the growing battery of paraffin-reactive immunohistological reagents, coupled with newer techniques of antigen retrieval, new vistas have opened in the study of BM biopsies (BMB) (6). Normal BM consists of a heterogeneous population of cells proceeding along various differentiation pathways. Although most cell types can be easily distinguished on BM aspirate smears and biopsy sections, IHC is valuable in identifying specific cell subsets. Fig. 1. Antihemoglobin stain highlighting erythroid precursors in bone marrow with megaloblastic leukemia. Erythroid cells account for 5-38% of the nucleated cells in normal BM. Antibodies reactive with hemoglobin (Fig. 1) or glycophorin A can be used to identify the erythroid cells in BMB. Myeloid cells account for 23-85% of the nucleated cells in the normal BM and can be effectively identified by using an anti-myeloperoxidase (MPO) antibody (7). MPO is expressed in cells of to the neutrophilic and eosinophilic series, as well as by some monocytes (Fig. 2). Other antibodies that can be useful in selected cases include CD15, CD45RO, and CD43. The KP-1 epitope of CD68 and lysozyme (Fig. 3) react with both myeloid and monocytes/ macrophages cells, the PG-M1 epitope is mostly restricted to latter cells (8). Megakaryocytes can be identified in tissue sections by their positivity with factor VIII, CD42b, CD61, CD31, and anti-LAT. Although these markers are more strongly expressed in mature megakaryocytes, they can also be used to identify immature cells of the megakaryocytic lineage (9). Fig. 2. Myeloperoxidase stain in bone marrow, which highlights granulocytic cells and some monocytes. Fig. 3. Lysozyme immunohistochemical stain, highlighting numerous granulocytes, monocytic elements, and macrophages in this bone marrow. Fig. 4. A CD3 stain showing infiltration of bone marrow by numerous T-cells in this case of T-cell large granular lymphocytic leukemia. 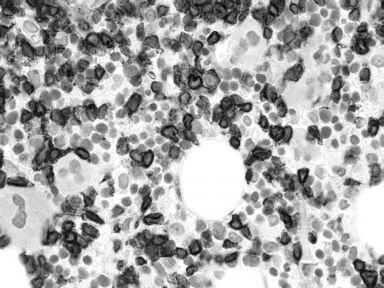 Lymphocytes typically account for 1-5% of the nucleated cells in the normal BM. Lymphoid follicles may also be observed, especially after the age of 50. 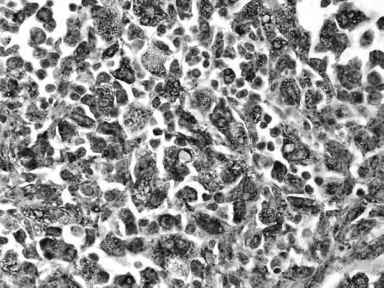 There are a wide variety of antibodies available for identification of benign and malignant lymphoid cells in BM. The most useful of these are CD20 (B-cells) and CD3 (T-cells) (Fig. 4). TdT-, CD10-, and CD79a-positive early B-cell precursors (also termed hematogones) are normally present in small number in the adult marrow, whereas they are more numerous in the pediatric ages. 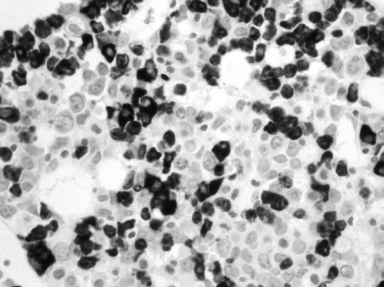 Hematogones are occasionally difficult to distinguish from acute lymphoblastic leukemia (ALL). In ALL, the blasts are usually uniformly positive for CD34 and TdT, and hemato-gones are less uniformly positive for CD34. In both pediatric and adult BM, CD34-positive cells, which may be either myeloid or lymphoid precursors, are present singly and account for less than 5% of the nucleated cells (10).